A face with tightly-closed (boomerang) eyes, large curved eyebrows and slightly downturned curved mouth. This is one determined emoji, bound to accomplish greatness. Bolster, sustain, or uphold. Insist. To persist in anything undertaken. To maintain in spite of difficulty or discouragement; continuing steadfastly. A champ! 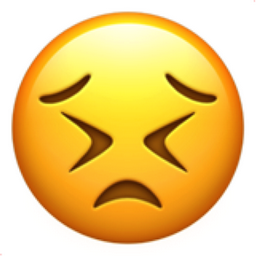 iEmoji old name: Sad and annoyed. Nothing seems to be going right.